A pre-qualifying downpour made wet tyres a requirement for all three qualifying sessions at Spa-Francorchamps. André Lotterer had a lot to deal with in the first session, whilst Esteban Gutiérrez suffered yet more Sauber mechanical failures. Otherwise, there wasn't too much to surprise until the top ten shootout. With everything to play for, the Mercedes duo had a big fight going on between them, with other teammate battles at Red Bull, Ferrari and Williams as well. Relive the action with these handy Factbyte Factbox highlights. Hello fact-hunting friends, how have you been? It's been an absolute age but here we are, together again, ready to enjoy qualifying for the Belgian Grand Prix. Well, maybe. It's absolutely pouring down at the track, to the point where Mercedes call it extreme "even for Spa." So, there could also very conceivably be a delay. So far, each Mercedes driver has been fastest for a Friday practice session, whilst Valtteri Bottas moved to the front this morning. Pastor Maldonado suffered a huge crash during second practice, which he says wasn't driver error or mechanical failure, but simply attributable to luck. He went to the medical centre for checks but is fine to continue today. The Lotus team could do with a driver keeping it on the straight and narrow, though, with just eight points on the board. The battle between the Lotus drivers in qualifying is the most one-sided, with Romain Grosjean outqualifying (purely based on numbers, incidents notwithstanding) Pastor Maldonado on ten occasions. Things are a lot closer at Williams, who were looking strong in the practice sessions this weekend. The skies are blue over Spa now, with the rain clearing and the official radar saying no more "heavy" rain. The FIA cars have gone out on track to check conditions, fifteen minutes to go until qualifying should start. Long shots up and above the track show steam pouring off the trees that surround the track. Still blue skies ahead, and you can see the hefty shower we just had moving away from the circuit. Drivers are getting nice and settled in their cars now. Kimi Räikkönen pulls on his gloves as he analyses the screens in front. Two Marussia drivers sit at the end of the pit lane, green intermediate tyres bolted on their cars. Ron Dennis stands at the pit wall for McLaren, having a quick chat with Éric Boullier who nods enthusiastically. Two Caterhams and two Toro Rossos follow the Marussia duo out. All on intermediates so far. Some have filtered out on full wet tyres (blue sidewalls), including both the Williams drivers, and the Sauber pair as well. The tyre blankets come off Lewis Hamilton's car, with the green intermediates on the Mercedes. He heads out for a sighter lap. There's a lot of spray coming off the cars around the track, particularly down the home straight. All drivers are out on track now barring Nico Hülkenberg, who remains in the Force India garage. Daniil Kvyat runs a little wide, but is on for completing his first lap time of the session. Jules Bianchi sets a 2:16 which is clearly not a representative time. Kvyat's is two seconds faster. Lotterer also has a brief off, running off track at turn 18 but rejoining the action unharmed. Tweet from @MercedesAMGF1: Plenty of sideways action out there - nothing better than watching the best of the best showing their skills. Majestic stuff all round! Nico Hülkenberg has left the garage, meaning all 22 drivers are out on track now. It's such a long circuit, though, 7km, that traffic isn't likely to be a problem. Kevin Magnussen ran off track, causing very brief yellow flags. Lewis Hamilton does the same thing, but manages to go fastest with a 2:09.4. Replays show Hamilton locking up and going straight on at the corner. How he still went fastest, I'll never know. He also gets on the radio asking the team not to talk to him during a lap. Lotterer runs off track again. Very tough debut for the Caterham driver, a wet qualifying at Spa! Button and Räikkönen return to the pit lane for a brief stop. Times are dropping rapidly so there's no time for waiting around. Rosberg has joined Hamilton at the top, their times now down to 2:07, with Ricciardo a further three seconds behind. The Caterham pair return to the garage. Lotterer is currently six seconds off his teammate, who in turn is eight seconds off the top times. Yellow flags as Esteban Gutiérrez slows to a halt, drifts backwards slightly, and then stops at turn 15. The marshals push the car out the way quickly. All the cars are now on intermediate tyres as the track continues to dry slowly. Just over six minutes left to go. With all bar Sergio Pérez (and Gutiérrez) completing a lap, the drop zone features Sutil, Grosjean, Chilton, Räikkönen and the two Caterhams. Räikkönen was on a flying lap but lost a lot of time going over the kerbs. He's going round again. Ferrari teammate Fernando Alonso is up in sixth, the gap between the two about four seconds. Gutiérrez radio reported: "There's something wrong with the power of the engine." "We've seen some issues," the pit wall confirmed. Lotterer is closing the gap, slowly, now just four seconds behind teammate Ericsson. He's currently outside the 107% cutoff though. Räikkönen managed to haul himself out of the drop zone, moving up to eighth place. Maldonado and Pérez are now both down there, with Jules Bianchi currently 16th. The Marussia driver improves to tenth place. Times dropping rapidly here. Romain Grosjean runs off track at the end of the home straight but continues. He's now 11th. Teammate Pastor Maldonado spins and causes a yellow flag briefly, but then gets the Lotus pointing in the right direction once again. Vettel had to take avoiding action there, moving out of the way of the Lotus. He's currently 7th though, so not in any danger. Now Lotterer's on form, he's improved to half a second faster than Ericsson. That's the kind of thing I was expecting to see. Maldonado completed a lap unscathed to move to 16th and out of the drop zone, but Sutil improved and dropped the Lotus driver back into the bottom six. Great job by Jules Bianchi to finish 14th in that session and move on to Q2. Also a good job by Lotterer to outqualify Ericsson, but very telling that neither Caterham could beat Gutiérrez despite the fact the Sauber was out for half the session and set his time on the wrong tyres. The fastest three in that session were Nico Rosberg, Lewis Hamilton and Felipe Massa. Graeme Lowdon, Marussia: "Both drivers did really well, it was one of those tricky sessions. An awful lot of communication on the pit wall and in the garage, trying to get the guys in the right place. A good team effort all round, nice to get into Q2. It was constant communication with the drivers, who always stay so incredibly calm, with the race engineers. Very variable in that session, with the threat of rain coming in as well, and how you balance these new power units through qualifying. It’s very tricky, a good team effort." Romain Grosjean heads out on track early, soon joined by the rest of the field. Within a couple of minutes all bar the Toro Rosso duo are out there testing the track conditions. Team radio to Sergio Pérez, they're expecting rain: "This run could be the fastest of the session." Now it's just Vergne left in the garage, as teams desperately try and get a banker lap in. There's light rain falling again now. It's intermediate tyres all round for the Q2 runners so far. Grosjean asks if everything is okay on the rear of the car, he's been struggling with that all weekend, particularly with rear tyre wear during practice. Romain Grosjean sets the first lap time of the session, a 2:13.9. Jenson Button, still wearing that pink helmet from the last few races, crosses the line for a 2:09. Visibility is getting worse on that long view down the home straight. Bottas drops the benchmark by a second, with Fernando Alonso going even faster for P1. 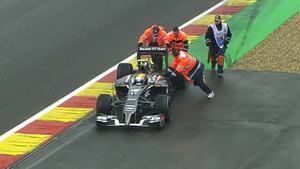 Lewis Hamilton cut the chicane after a lock-up at Les Combes. Grosjean also has a big spin but continues onwards. Rosberg jumps up to P1, as Hamilton's lock up messed his first attempt at a lap. The second flying lap puts him in the lead with a 2:07, a second faster than his teammate. In the drop zone now: Kvyat, Pérez, Sutil, Grosjean, Bianchi and Vergne. Vergne sits in the drop zone, but has only just left the garage to set his first lap time of the session. Button is told he has time to change gloves when they come in for a quick pit stop, they must be getting quite wet in the rain. All 16 drivers are out on track now, all on intermediate tyres. The light rain seems to have cleared a little now. Drop zone currently features: Vergne, Magnussen, Sutil, Pérez, Grosjean and Bianchi. But all are on laps at the moment. Lewis Hamilton improves on his own time for a 2:06.609. Rosberg closes the gap to about a tenth of a second. Jenson Button improves to ninth place, which pushes Sebastian Vettel into the drop zone. The German improves to push out Daniil Kvyat, who sits 11th with teammate Jean-Éric Vergne in 12th. The fastest three in that session were Lewis Hamilton, Nico Rosberg and Fernando Alonso. A disappointed Esteban Gutiérrez: "It’s already too many sessions that we lose to technical problems. It becomes to be too much. It’s something that needs to be changed. We are not going to accept being like this any more." 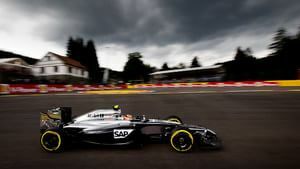 Nico Hülkenberg: "Definitely not the outcome that we hoped for. I think we started off okay but then progressively went backwards. I didn’t put the lap together that I should have done, and yea there we are out of Q1." Sebastian Vettel was queuing up at the end of the pit lane for the session to begin, and both the Mercedes drivers followed him out. Five drivers out on track, all on intermediate tyres. Four more quickly join the action, leaving Kimi Räikkönen the only one still to come out. The Finn joins the fun, meaning all ten drivers are out on track looking to set a first flying lap time. Hamilton begins his lap but goes very wide into the first corner, putting him on the back foot right at the start. The track is drying slowly, not quite a dry line but definitely less spray. Vettel crosses the line for the first time of the session, 2:08.141. Hamilton slows to back off from his lap, completing a 2:11. Nico Rosberg is on it, though, he shaves 2.4 seconds off Vettel as Fernando Alonso slots into third just two tenths slower than the Red Bull. Tweet from @pirellisport: "By the way, rain tyres (both full wet and inters) are not made to degrade like the slick tyres." Tweet from @F1Racing_mag: Sunshine! Welcome respite for the hardy folk out in the grandstands. All ten drivers now have times on the board, Hamilton was last oh-so-briefly, before moving up into second place with a more representative lap time. It's that brief qualifying pit-stop time now, as Rosberg and Alonso head back towards their garages. Felipe Massa currently brings up the rear of the top ten, with two McLarens ahead of him. Four minutes left on the clock. A quick top ten at this point, Rosberg, Hamilton, Vettel, Alonso, Räikkönen, Bottas, Riccardo, Button, Magnussen and Massa. The sun is definitely shining now, but it's still intermediate tyres going on the cars for their final run. Tweet from @bbcf1: . @nico_rosberg, topping the standings, has never qualified in the top three at Spa in seven previous visits. All ten drivers on track once more. Two minutes on the clock. All the action about to commence! Disregard what I said earlier, the cars have all emerged on track at the same time, so traffic IS a problem. Vettel crosses the line to remain third, but has time for another lap here. Hamilton slows right down around the final corner to clear himself some free space for the lap. Lewis Hamilton messes up the first corner again though, running wide, he could have lost his chance for pole now. Kevin Magnussen crosses the line for his lap that puts him currently fifth, a great job compared to Button in ninth. Ricciardo runs wide off track, bumping his way back to the racing line, but a ruined lap there. Fourth for the Red Bull driver. Hamilton crosses the line for second place, with Rosberg shaving a tenth off his own time for pole position. Pole position for Nico Rosberg with a time of 2:05.591. Magnussen outqualifying Button puts them on equal terms for the season-long qualifying comparison. Six apiece. Tweet from @MauriceHamilton: HAM had ragged lap, but at least he's at the front of the grid for the first time in 3 races. Paddy Lowe, Mercedes: Quite surprising pace from the car to be perfectly honest. We’ve got pole by over two seconds, which is tremendous. When you go into a wet session, anything can happen. All credit to the drivers because it’s very tricky to drive out there, but in terms of managing the session it was a lot easier than it could have been. Tweet from @steveslaterF1: Even Mercedes seem surprised by their pace. Looks like another Rosberg/Hamilton battle tomorrow. Alonso versus the Bulls should be fun too! Post-qualifying press conference - Nico Rosberg: "It’s awesome. At this track, it’s one of the most special tracks of the year, to be in front here is great. Not quite as difficult out there as on some occasions, as conditions were always intermediates, just varying slightly. It’s always difficult, on this track in the wet. I’m very happy, the car was handling well, together with my engineers we fine-tuned it perfectly. It’s only qualifying so still, a long race tomorrow, but of course, very happy." Post-qualifying press conference - Lewis Hamilton: "I had a glazed front left brake, so the car was pulling to the left or the right. There was nothing I could do to get rid of that, I was struggling in the braking… I was losing massive amounts, particularly in turn one. It’s more fun in the dry, but it’s still a huge challenge and as Nico said, the conditions were quite good today." Post-qualifying press conference - Sebastian Vettel: "It would be nice to be further up but obviously the gap is quite big. It was the best we could do today, it was a tricky qualifying. Q2 was quite tight, I stayed out on the same set of tyres, it started raining heavier, I was quite confident that the track won’t get quicker. I wanted to save that extra set for Q3. "It was quite tight, I got the lap in in the end because the circuit did pick up and in Q3 I was able to use both sets of tyres, it was obviously very tight behind the Mercedes. Tricky out there, especially on low downforce, especially through Eau Rouge. I had a couple of moments but it was a good challenge, and for sure happy with third." A good qualifying, then, setting up Spa nicely for a good race tomorrow. The top spots were reserved for Mercedes, but that battle continues to intrigue. Williams were disappointing in the final session, particularly after good practice pace. Red Bull have best of the rest pace, with Sebastian Vettel outqualifying his teammate. It'll also be good to see if McLaren can capitalise on a decent qualifying for once. Further back, Sutil did a good job, as did Jules Bianchi. André Lotterer started out slowly (literally), but gradually improved to outqualify Ericsson. That experience definitely helped. At Spa. In the wet. Fun session to cover, I hope you'll join me back here tomorrow for the race, where we'll see who can take the trophy home for the twelfth round of the 2014 season.